So you’ve decided to undergo a gender reassignment? Congratulations! You’re joining a large and varied group of people worldwide who have decided to do likewise. It’s a big decision, but for many one which helps them finally feel comfortable in their own skin. Now here comes the “but” – and it’s a big one! Realignment surgery is a major positive for most, but, as with any medical procedure, it takes something of a toll on the body. The effect of anesthesia is often non-trivial, and besides being groggy and disoriented for anything from hours to days after waking up, there is the matter of getting around without disturbing your sutures, packing, gauze, and what will naturally be some very tender areas for some time following! The very first piece of advice to follow here is this: Do exactly what your surgeon says in your pre-operative and post-operative periods. They will likely offer you extensive guidelines as to how to prepare yourself for the day of surgery, and it is imperative that you do everything you can to follow those. Likewise, the most important time in your recovery is the days and weeks immediately following your surgery, during which your body will be sensitive to even minor environmental changes. As such as it is key that you maintain your recommended diet plan, avoid any strenuous physical activity, and distance yourself from anything that could impede your recovery. 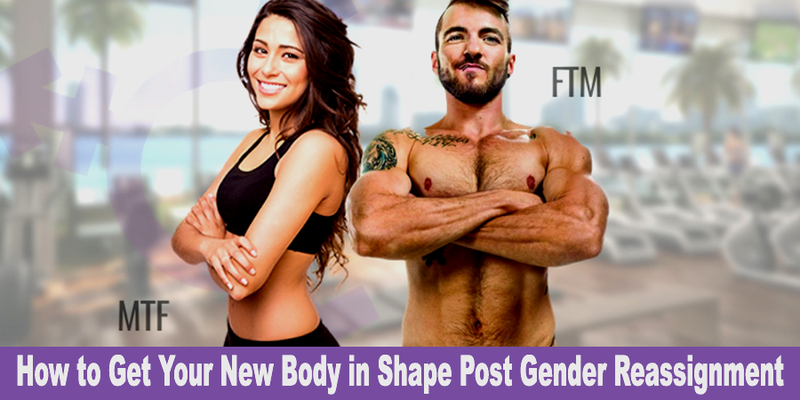 In fact, most people are ultimately looking to do some combination of the two, no matter whether they’re undergoing a male-to-female or female-to-male reassignment. “But I just want to tone!” you say. Well, I have a bit of news here: There’s no such thing as “tone”, per se. A “toned” appearance is essentially just one of low body fat coupled with reasonable musculature. Whether you’re looking at the Victoria’s Secret catalog or the cover of Men’s Fitness, you’re probably looking at someone who has less fat than average, and more muscle. 1. Restrict your caloric intake. 2. Increase your caloric expenditure. Generally you’ll want to do both to some extent, which entails eating less and exercising more. Simple, right? Our advice here is to start by evaluating your diet. Are there very calorie-rich foods you consume regularly? Could you replace, say, your indulgence in butter-heavy mashed potatoes with an extra side of high-fiber vegetables? Could you exchange your bowl of ice cream with a filling but low-calorie apple? If so, you’re already on your way! As for burning more calories, the trick is to find something you actually enjoy. If you’re like me, the thought of dedicating an hour a day to the treadmill is horrifying, but I’ll happily cycle the fifteen-mile round trip to the beach and achieve the same calorie burn. No matter what you enjoy, if you’re moving, you’re losing! Figure out which activities you enjoy most and work them into your schedule whenever you can. Oh, and make sure to stay hydrated! It’s very easy to confuse thirst for hunger, and that can add to your caloric intake unnecessarily. Again, there are exercise protocols galore, and your likelihood of succeeding increases greatly if you choose one you enjoy. If you’re picking up a bodybuilding routine for hypertrophy (that is, muscle growth), consider starting with a personal trainer – or at least a knowledgeable friend – to ensure you develop a balanced routine and use proper form. It is very easy to suffer minor, nagging injuries by lifting weights improperly, so find an expert so you set off on the right foot. The internet is rife with beginner programs that outline which routines will help you grow muscle in which areas, and almost every gym offers circuit training to walk you through the process. Again, diet comes strongly into play here. To grow muscle, you need to eat muscle fuel – namely, protein. For optimal muscle growth, you’ll need to consume at least 0.5g of protein for every pound of lean body mass. That is to say that someone weighing 200 pounds at ten percent body fat (that is, 180 pounds of lean mass) should be consuming a minimum of 90g of protein daily. That’s no small order! “Real” food is preferable (it typically has a more complete protein profile), but in a pinch you can up your numbers with protein powders, bars, and other quality dietary supplements. Top10supplements.com is a good place to start when researching the different kinds of supplements you may want to add into your daily routine. No matter how you choose to pursue your new wellness goals, please follow the golden rule: Be informed. There is a wealth of information available online these days, and by educating yourself on diet and exercise, you put yourself in a vastly stronger position to succeed.